The Vreneli is the informal name of a series of gold coins made in Switzerland. The coin is known by a variety of names, formally as Helvetia Head (English) Tête d’Helvetia (French) or Helvetiakopf (German). 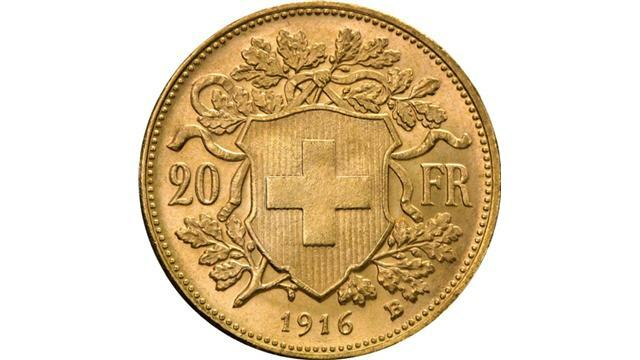 Informally it is also known as Vreneli, Helvetia, Swiss Miss or just as a Gold 20 Swiss Francs. The Vreneli is a bullion gold coin but does have numismatic supporters too. The coins were issued between 1897 and 1936, in 1947 and in 1949. The coin ceased to be legal tender in 1936 and all coins issued after 1936 are restrikes. The series consisted of 10, 20 and 100 Swiss franc coins. The 20 francs is by far the most popular. The 100 franc coin was only made in 1925 with a small issue of 5000. Over the series about 61 million coins have been produced. All the coins were made in 90% gold (millesimal fineness of 900). The reverse of the 20 franc coin shows the Swiss shield, featuring the Swiss Cross, and a wreath of oak along with the denomination. 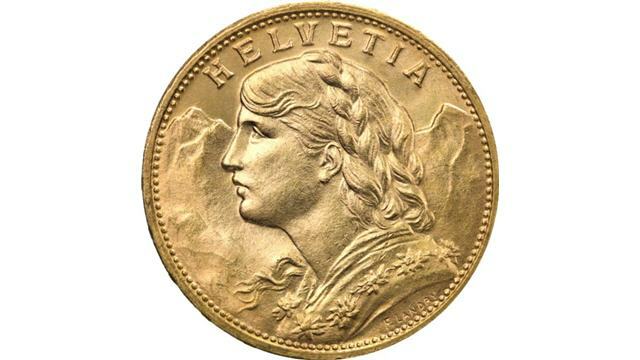 The Obverse shows the head of a lady with the words ‘HELVETIA’ written above. The coin is known as Helvetia due to the single inscription on the obverse. Helvetia is the female national personification of Switzerland, officially Confœderatio Helvetica, the Swiss Confederation. Helvetia is also a variation of the official Latin name of Switzerland. The name Vreneli is though to derive from Verena, another personification of the Confederation of Switzerland in the female effigy (similar to the American Lady Liberty). This is why the coins are sometimes colloquially called Swiss Miss. The design was by Fritz Ulysse Landry in 1895 and it is thought the model for the obverse was Françoise Engli. The coins were minted at the Swiss Mint at Bern (although the die was engraved at the Paris mint). The coins carry a mint mark of a “B” (without a dot) for Bern. The restrikes have a mintmark of “L”. The 10 franc coin weighs 3.23g and has 2.9g of pure gold. The two images used are licensed under the Creative Commons Attribution-Share Alike 4.0 International license. Source http://www.coininvest.com Author: CoinInvest GmbH. Schweiz: 20 Franken L-1935-B Gold, KM# 35.4, VZ-XF, #F 1548, "Vreneli"